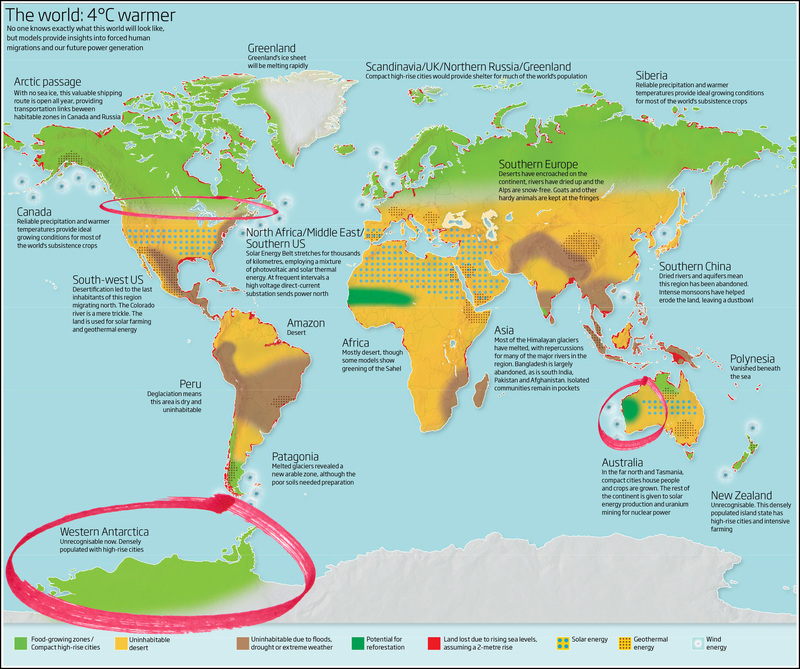 New Scientist magazine has created this map of what the world will look like after an additional warming of 4ºC or so. It looks like Orange County is no longer either red or blue, but more of an uninhabitable yellow with every square meter crammed with solar generators. On the bright side, life in Western Antarctica looks pretty nice. Dense high rises, just like the liberal urbanists want, and plenty of food growing zones. Sightseeing tours to see penguins will be easier than ever. There’s probably still some good skiing in the Ellsworth Mountains, and if not, the Transarctic Mountains are a short plane ride away. Alternatively, if you want to make plans more quickly, the northern US from Seattle to Minnesota looks awfully nice. You can buy land pretty cheap up there right now. Finally, there’s Perth. I’ve always had a soft spot for Perth, even though I’ve never been there. It’s labeled “potential for reforestation,” but I’m sure that means there are some nice temperate areas here and there on the margins? And plenty of energy! New Zealand will apparently be a garden spot too. Of course, Africa, Asia, South America, most of the United States, most of Australia, the Middle East, and all of Europe south of Siberia will be howling wastelands. Omelets and eggs, you understand. But not to worry. Just as in the movie 2012, I’m sure that rich people like you and me will find a nice place to survive.